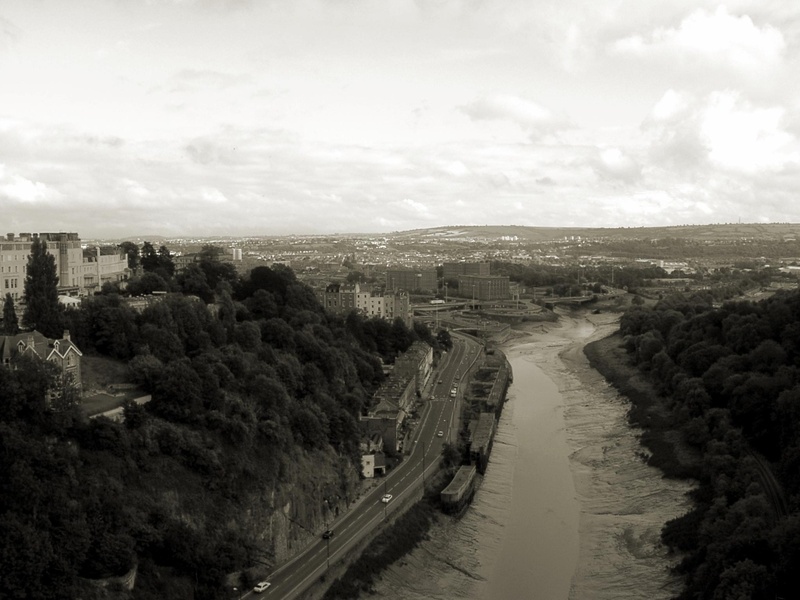 The River Avon as seen from the Clifton Suspension Bridge in Bristol, England. I was listening to charming set of radio plays concerning the family history of a Welsh jazz guitarist and her family's connection with the Fisk Jubilee Singers this evening. They compensated for a day when I really lacked the enthusiasm to head out with my camera. The story highlighted the cultural differences (and similarities) between 19th and 20th century Welsh women and the newly-emancipated American ex-slaves of that singing group. As I listened, I was thrown back to a time in the early 1980s when I lived in Bristol, England and used to visit the Avon Gorge Hotel accompanied by my friend Neil. We would go once a week to drink the beer and listen to an English jazz performance by some local or nationally known musician. This was usually a low-key affair, with just a handful of local jazz enthusiasts. British jazz fans tended to be earnest and almost too-knowledgeable individuals fairly secure in the proposition that the home-grown variety of jazz, in marked contrast to rock music, remained an obscure and relatively unassuming endeavour compared with the American model. Still, some very talented players came through the Avon Gorge, earning what must have been subsistence level cash only. Loving what they did, mind. At that time, American music still had that exotic quality that is frequently attached to foreign things. Now, having traveled repeated across the land and through the cities that spawned and continue to spawn the original article, I look back on my attitude of that time and see how quaint and ill-informed it was. Not ill-informed in terms of knowing the music or the artists, but ignorant of the cultural background behind those American artists. There is no doubt that my appreciation of the music, a constant throughout my life, has broadened and deepened because I know where it came from and can feel where it came from. Not completely of course, but much closer than I would have ever known if I'd stayed in England. I greatly treasure this little wisdom that life has given me. Beautiful! I could almost tell it was England even before I read the post. I never knew jazz was at all popular there. 😆 The beer was very good, Ed. So you don't 'get it'? Ha! I must be better than you. :DI've always loved jazz of all kinds. It's uniquely evocative. :lol:You know my last girlfriend was too politically-minded to waterboard me. So she played this Miles Davis album instead. And she played it a lot. :pI do love Keith Jarett's playing of Handel though. And I would love to have his WTC1. As for his own jazz stuff I listened to a bit of it with Julie. Not entirely bad stuff that. Though I wouldn't buy the albums.